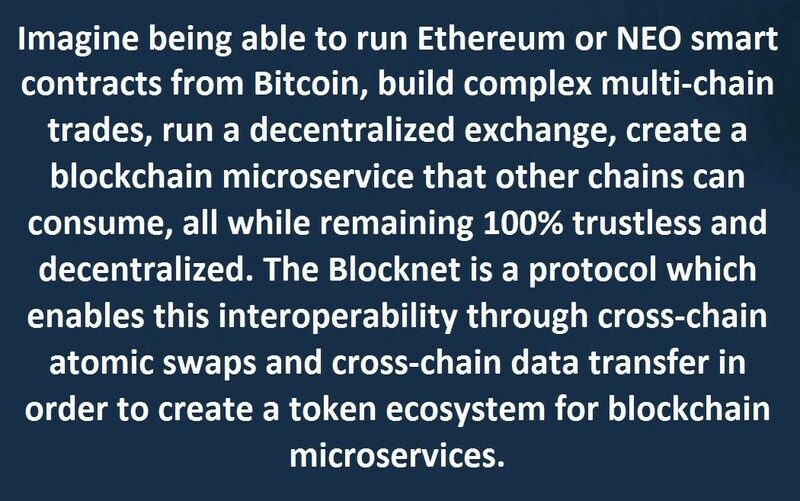 The Blocknet protocol is a true peer-to-peer protocol between nodes on different blockchains and enables the delivery of potentially any kind of digital service from a node on any blockchain to a node on any other blockchain. It is blockchain interoperability at its finest and forms a general-purpose infrastructure for inter-blockchain services. It is designed to enable the emerging “token ecosystem” in which the Blocknet enables inter-blockchain services, such as decentralized exchange, monetised API consumption, and p2p digital service delivery. The purpose of the router is to trustlessly direct service requests through the proper service nodes. For example, let’s say there is an exchange to trade PIVX for Syscoin. Not all service nodes may support PIVX and Syscoin. Therefore, the router will send this transaction through a service node which does support the appropriate/respective assets in order to complete the exchange and collect the fee. The exchange component allows for trustless transactions between different blockchains. Cross-chain atomic swaps may be performed between any asset that is supported by the protocol. Any asset that has a stock JSON RPC interface cloned from Bitcoin Core and supports OP_CHECKLOCKTIMEVERIFY is compatible. As a result, the Blocknet supports the majority of cryptocurrencies in existence, and no permission from anyone is required. The third component of the protocol is trustless cross-chain data transport. This component allows for data and information to be sent from one chain to another, greatly increasing interoperability and the potential use-cases and implementations of this protocol. Decentralized Exchange: The first application built on the Blocknet protocol is the Block DX. A 100% decentralized trading platform allows trustless P2P trading directly from the wallets of the coins being traded. Users are able to conduct trades in real-time via manual order matching and there is complete trading pair freedom so any two supported coins can be traded. With no accounts or sign-ups required, no listing fees, and no middle man, the Block DX represents decentralization in action. Protocol Service: The ability for any given blockchain service to function as a “protocol service”, that is, to be consumable by any other dapp (Decentralized application) anywhere instead of only by its own Blockchain and community, thus greatly enlarging the service’s market reach and potential revenue stream. An example of this is a dapp consuming Golem services to support computational features. Dapps: The ability to create dapps with a multi-chain architecture, leveraging relevant services no matter which chain they are available on, removing the current need to commit to one blockchain. Developers and make blockchain-agnostic design choices and pull in the services needed from other blockchains instead of making trade-offs by selecting an existing dapp platform. Smart Contracts: The ability for smart contracts to function not as “dapps” but as “protocol tokens,” where code quality is enhanced by a broad contributor-base of developers from diverse communities, preventing chain bloat and the duplication of code and labour. Developers can therefore deliver services to the entire blockchain-consuming market, instead of the users of one blockchain. Microservices: The capacity for a microservices architecture on which each blockchain delivers a single service, integrated with many others in a modular fashion, providing simpler component design, easier bug-fixing, and smoother upgrading. This can be viewed as bringing the concept of software libraries to blockchain. Monetisation: The monetisation of inter-chain and multi-chain services, using their intrinsic tokens of value. As services of one blockchain are consumed by another, those services are paid for through use of the respective token. Business: The full exploitation of new, crypto economically-driven business models ushered in by blockchain technology, in which a business may extract value from a “better than free” model: from monetary policy directly (ICOs, transaction fees, deflationary economics, etc), and from a marketplace for its monetized APIs. A decentralized protocol like the Blocknet’s is a key enabling technology for the decentralization of money, but it will have the further effect of enabling digital services to be paid for in virtually any token, frictionlessly, anywhere in the world. This will change e-commerce as we know it. To monetise an API currently requires a cumbersome, costly integration to a third party payment gateway, and the high transaction fees of card networks prevent the emergence of entire business models, like micropayments and global bankless payment apps. Any service or orchestrated sequence of microservices provided by dapps may be delivered over the Blocknet’s infrastructure. Using decentralized exchange, these services are intrinsically monetizable, removing the friction and high costs of traditional payment networks — friction which has prevented the monetisation of the bulk of the API ecosystem. In short, the Blocknet represents a real revolution of the crypto space. To find out more about the Blocknet protocol, please view the whitepaper and read about the latest developments in our newsletter.